OUR PRICE: $73.95 - Join Rewards Get $7 Dance Dollars On This Item! 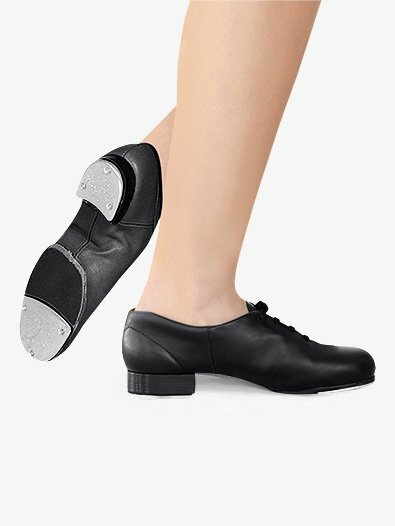 Capezio's "FlexMaster" split-sole tap shoe features TeleTone toe taps on the leather mounted forepart, adding weight to help produce a deeper resonating sound. This shoe also offers a strong toe box and the Poron insole provides shock absorption and extra-plush comfort. 3/4" heel. Suggested Fitting: Women order same as street. Men order 2 sizes larger than street. The best tap shoes for wide feet!! These shoes make it so easy to do toe stands!!!! And they are really comfortable. I had tried lots of different tap shoes but now I swear by these. I buy them every time. The insert did not extend all the way- no support or cushion at all from the ball of the foot to the end of the shoe. Very strange. I wore them once and bought a different brand. Very disappointing considering I usually swear by Capezio tap shoes. My daughter was having trouble doing toe stands in her taps until we got these shoes. She says they are very comfortable. The heels are low profile that after some wear they will slip right off. We have tried so many remedies that failed. I had to buy her another brand, but she misses these due to the split sole and comfort. Great shoe. I got them for a friend who is a beginner in tap. Get a half size bigger than your street size. They run a bit small. This is my daughter's 2nd pair. She is an intermediate tapper, and sometimes suffers with arch pain. These shoes are soft, flexible leather and seam to provide nice support. The foot-pain complaints definitely have lessened since we switched to these shoes. She is 10 yrs and wears a size 3 street shoe. She is just outgrowing her size 4 adult tap shoes, and this time I purchased her a 5. So I would estimate ordering between 1-2 sizes up from street shoe. Expensive when I know she is going to outgrow them, but worth it in comfort. I purchased this tap shoe as a replacement for Capezio M60 taps that I wore for a few years. I loved the M60s because of the hardy build underneath the toe and heel plates. They recently broke (as all shoes do if you wear them), but the model for women was discontinued. I searched for a new shoe that would measure up to the M60 taps I love and be in my poor college kid price range. While I prefer a stronger build underneath the plates, the flexibility of this shoe is definitely interesting. It takes some getting used to if you have danced in straight oxfords and/or character taps. I will say that you can feel the floor once you have found the nuances to the sound placement of these taps. I recommend these taps for intermediate-level dancers. Because of their similarity to a point shoe when performing toe stands, a strong ankle is key. Do not purchase these shoes if you/your child performs hoofing style pieces and is not prepared for an ankle workout. As a dance teacher, I would prefer my beginning students to stick to a straight oxford. If you do purchase this shoe, loosen the toe plates to free up the sound. I also recommend performing ballet barre exercises (plies, ronde de jambes, relevees, etc.) to break them in. I prefer a tap shoe to fit like a street shoe, so I ordered my street shoe size and the taps run true. If you like a tight fit, you may consider going a half size smaller than your street. Overall, a good price for the shoe. You are paying for slightly cheaper quality, but I'm definitely a Capezio advocate when it comes to tap shoes. Bravo on a solid, intermediate tap shoe! Quite comfortable, very durable, and excellent to use in a recital or stage show. This product runs a little small. I usually wear a size 9.5 W, but I ordered a 10W based on the other reviews. And that size fits me perfectly. So I definitely do recommend ordering a half size larger. The shoe is VERY comfortable, which is a big deal to me. Most tap shoes my kids have used are stiff and uncomfortable. But these are very nice to wear. Since I am really just a beginner, I don't have much of an opinion about how the taps SOUND. At this point any problem with the sound is probably more a lack of skill! Love these tap shoes for the flex option and strong toe box. Great sound, great quality. My only comlaint is the heel. It's short, so it makes the shoe feels like it's going to fall off while you're dancing. These shoes fit great! I ordered a 1/2 size bigger than my street shoe size tho and I think anyone who orders these should as well. These shoes are very comfortable and have a lot of support. I love these tap shoes....they sound awesome. For those who say they are not very loud all you need to do is tune them by loosing the screws that hold the taps on. They are super comfy but run about a half size small if you ask me. I am a 9 and their 9 kills my toes but other than that they are great! Great shoe for those it will fit; too wide (even the medium width) for my foot and too flimsy. Sound quality not the greatest and the screws seem really hard to get loose (we loosen screws to get a better sound quality like most people do) So many people love these, are comfy with the insole but run wide and many of my dancers fall over in toe stands as they break in super easy and do not provide as much support. But, if you're not good at breaking your shoes in, these are super soft and doesn't take much to get them broke in! Love TeleTones but screws need to be loosened for better sound! 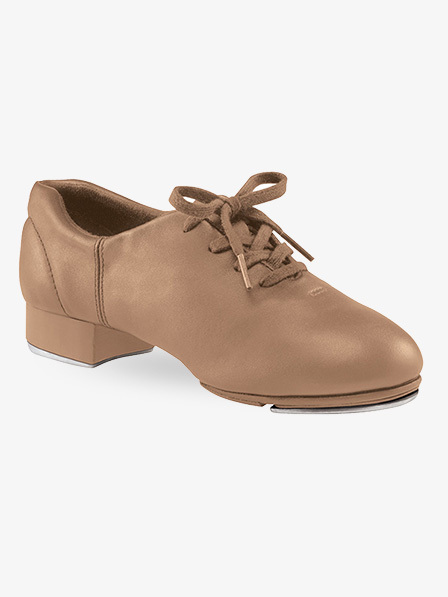 I just got these shoes and wore them for my hour long tap class. The fit was great. I wear a size nine and that's what I ordered. Toe stands are super easy in these shoes, but they dyed my heels black because I don't wear socks. I would also recommend loosening the front taps a little to get more sound. They are very slippery at first but these are great quality shoes, and even the price seems bearable now after wearing them. Although they are very comfortable, I don't like the sound quality very much. This is the nicest tap shoe that I have ever used. It's extremely comfortable and allows your foot to move freely, but still has support to it. Toestands and heelstands are effortless. It creates a lovely sound with great clarity. Personally, I had no issues with sizing. I ordered the same as my street shoe size and the tap shoe fit perfectly. You do have to pay attention to where you hit your toe for toe tips to get the sound in, because if you hit your foot straight up and down or leaning more towards the top of your foot, the tip of the actual shoe gets in the way and you just hear a thud. The shoe also lies nice and flat equally throughout the shoe; the front part of the shoe doesn't curve upward and the heel is firmly planted on the floor. Just be sure to be careful when breaking them in as with all taps because they are extremely slippery at first. I'm talking like 5 pirouettes with little effort slippery. Is the heel of the tan tap shoe a wood grainmatching the shoe leather? The picture is showing it matches the leather of the shoe, but I recently orderedgot a heel with a wood grain heel. I am fine with this but concerned because another girl in the class is ready to order this shoenoticed the picture is not with a wood grain. They need to match. The shoe will be as shown in the picture. Should I order these in 8-1/29? Hello! Thank you for contacting us. We recommend to order the same as the street size or, 1/2 size larger for wide widths. I'm new to tap and want to be sure I order correctly. I'm a 65 yo male. I know I'm to order 2 sizes larger than street shoe, but I see no explanation of what the drop,down menu with M and N refers to. M and N are in reference to the width of the shoes. M is medium, or average. N is narrow.